Is Deep State Already Planning Their Next Massacre Of Americans? Is 'Deep State' Already Planning Their Next Massacre Of Americans? Real Investigation Of Florida Shooting Would Expose Satanic Secrets And Crimes Of Hillary Clinton And The DNC! I always say that everything is in the patterns. Any one fact about, say, the JFK assassination may be dismissed by a “skeptic,” although most of these people seem to be professional debunkers. But the overall pattern of evidence is damning. The same is true of Waco and the Oklahoma City bombing, or the first WTC bombing. By contrast, 9/11 was in-your-face, blatantly obvious to anyone able to see (perhaps nearly a third of the population by now). And mass shootings often leave a pattern of evidence indicating that they are false flag operations, staged by the Deep State to provide a rationale for “gun control,” meaning confiscation of all weapons owned by us “deplorables.” Of course, our would-be masters have no desire to disarm the criminals, for they are criminals themselves and even armed a Mexican drug cartel via the “Fast and Furious” operation. Taken as a whole, all these terrible crimes, each with its own pattern of evidence, add up to a larger overall pattern. 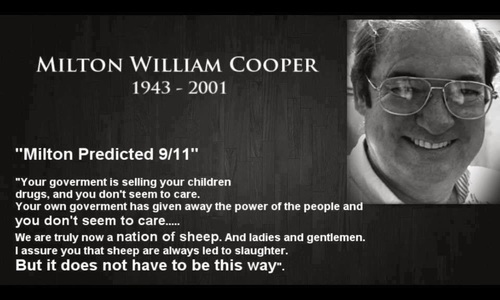 The US government and, infuriatingly, many state and local governments are controlled by an elite who positively delight in mass murder, especially the satanic sacrifice of young children. Let’s take a look at two of the most recent mass shootings. On 10/1/17 a man named Stephen Paddock, who had no prior criminal record and no known affiliation with any kind of terrorist or extremist group, allegedly booked two adjoining rooms at the Mandalay Bay hotel in Las Vegas, amassed a huge store of weapons and ammunition including ten AR-15 rifles with 100 round magazines, and opened fire on the crowd attending a country music concert, the Harvest Music Festival, an open air event some 490 yards from his room, wounding 422 people. Allegedly 58 of them died, making this the greatest mass shooting in US history. Supposedly he used “bump stocks” which can convert a semi-automatic rifle into a kind of full auto weapon. We are told that he fired over 1,100 rounds in the ten minutes from 10:05 to 10:15. The first problem with this official scenario is one I have written of previously. Yes, with all those rifles and huge magazines, he could have fired that many rounds. But he was firing at extreme range; weapons are far less accurate on full auto; and bump stocks are even less accurate than full auto fire with a weapon designed for the purpose. Yet, even if we allow for 1,200 rounds fired, he hit one person for every 2.8 rounds. With people running for cover and dispersing, this would be virtually impossible. Initially, the Clark County Sheriff, Joe Lombardo, said Paddock had help. Then he changed his story, making Paddock yet another in a long line of “lone gunmen.” Then he changed his story again, saying someone else was involved, but no one in law enforcement has bothered to elaborate on this, and no one else has been charged. In fact, Lombardo repeatedly changed his story about virtually every aspect of the shooting, over and over. At one appearance before the cameras, a visibly nervous Lombardo stood next to a sinister-looking individual in plain clothes. As usual, the FBI had inserted themselves into this sorry business right from the start…was this man an FBI agent making sure Lombardo stuck to the (ever-changing) script? Had the FBI threatened Lombardo? To clear up some of the confusion about the police and sheriff’s department in Vegas, they are one and the same…there is only a sheriff’s department and no separate city police department. Ironically, this came about due to massive corruption in the city police (this is depicted in the movie Casino) at a time when Clark County had an honest sheriff. Then there is the lack of any motive. Paddock had supposedly had some gambling losses but was still quite wealthy. Yet he decided, just for the heck of it, to spend thousands on weapons and risk almost certain death or imprisonment to murder people he didn’t even know. Really? Supposedly a Mandalay Bay security guard, Jesus Campos, was sent to the 32nd floor just before 10:00 because an access door had been blocked (supposedly by Paddock). Paddock then (we are told) fired through the door of his room and wounded Campos. Then maintenance worker Stephen Schuck (the same first name as the alleged shooter) arrived, and, seeing that Campos was wounded, called the front desk. Police arrived at around 11:17, more than an hour after the shooting stopped. At 11:20 they blew the door and entered Paddock’s room, allegedly finding him dead by suicide. Why had he not escaped in all that time? The only “proof” of his death is a photo showing the lower legs of someone who could be dead or alive, Paddock or someone else. And no one else on that floor heard all the shots and notified the police or the front desk? And Paddock carried perhaps 200 pounds of weapons and ammunition to his room and no one noticed? We are told that he put a surveillance camera in the hall…no one noticed that either? Many people thought they heard gunfire from multiple shooters from different directions, and even gunfire in other Vegas hotels; Las Vegas Fire Department personnel were sure that there was another shooter on or near the top floor of the Mandalay Bay. Maybe this could be attributed to panic, confusion, and echoes…maybe. But Paddock’s house in Mesquite was burglarized by persons unknown before the intrepid FBI men could search it…why was it not secured? Or did the FBI themselves break in and destroy evidence? Incredibly, Campos was allowed to go to Mexico after the shooting, although he returned. And other guards at the Mandalay Bay claimed that they did not know Campos and had never seen him. The FBI confiscated every cell phone they could and erased all the pictures before returning them to their owners. Authorities refused to release autopsies of the victims, even with names redacted. The Clark County Coroner, after much public pressure, finally released an alleged autopsy of Stephen Paddock, describing a man several inches shorter than Paddock. And several survivors said a woman, just before the shooting, told them that they would all die. There’s more, but that should do for now. But it wouldn’t have mattered anyway, since local police and deputies had been called to his house 39 times due to his violent acts and blatant threats, but both they and the local school district have long had a policy of not arresting even violent teenagers, less the crime statistics make them look bad. Had they charged and tried him they could have confiscated his weapons, but they want to disarm the victims, not the murderers. The heroic Deputy Scot Peterson, assigned to protect the students, people he saw every day, played it safe and stayed outside, letting them die. He was joined by three more heroes, and they all stayed safe and did nothing; it has now been verified that they did so on the orders of Sheriff Scott Israel. They also prevented EMT personnel from entering the buildings and saving lives. Even compared to previous crimes by our elites, this is mind-boggling. Their radios then went out for no apparent reason; the same thing had happened during the 2017 Fort Lauderdale Airport shooting. Sheriff Israel has refused to release surveillance videos that might shed light on the matter; this, too, is a common pattern in these events. Per WND, there have been over 60 criminal investigations of the Broward County Sheriff’s Department since 2012, for drugs, destruction of evidence, and numerous other crimes, but nothing has been reformed and the genius voters keep reelecting Israel. The Sheriff is a Demoncrap, a crony of Debbie Wasserman-Schultz, and posed for a picture with the bug-eyed Witch Hillary. He has long advocated disarming the commoners. 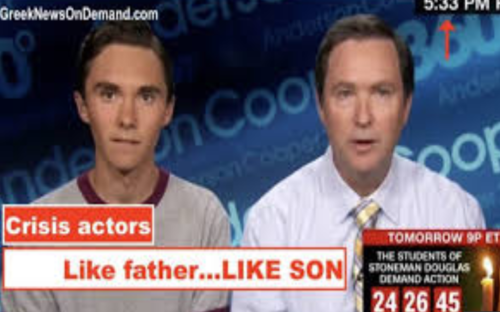 And a student named Hogg, son of a retired FBI critter, has been on TV advocating this same cause, and made a video, either during or before the shooting, depicting him and others allegedly hiding from the killer and advocating “gun control” and “diversity.” As if all of this isn’t enough, one student claimed she was talking with the alleged killer, and he was unarmed, and she could hear shots coming from another part of the building. And the good Sheriff had met and posed for a picture with members of CAIR, a group linked to Islamic terrorism, and had at least one Muslim deputy. All of this, taken together, beggars the imagination. 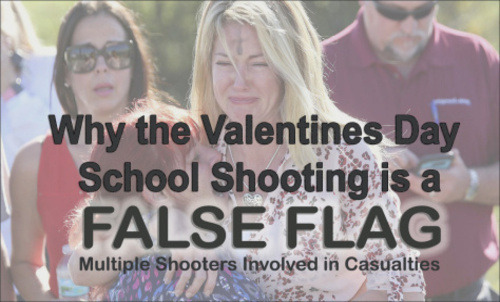 This was a false flag…period. Either the government did an act of mass murder or they faked it, or a little of each. Remember, if anyone deliberately allows a mass killing to happen, he is every bit as guilty as the trigger puller. 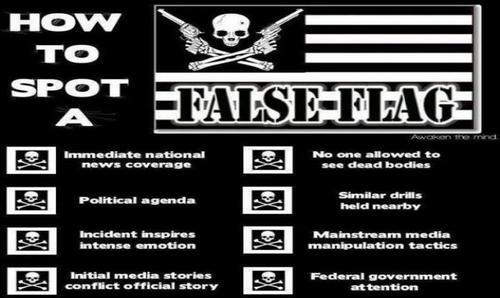 In fact, virtually every major terrorist act or mass shooting in the US during the last two decades or so was a false flag. Now we are told that Florida Governor RINO Rick Scott (the Scotts are piling up here…more synchronicity), is ordering an “investigation” of the Broward County Sheriff’s Department. Really? Will that produce the same results (none) as the last 60 “investigations”? Scott has the authority to fire Scott right now, and to question the deputy Scot and the others. This case has the potential to blow all the Deep State’s secrets wide open, and a real investigation by Trump’s “Justice” Department could soon reveal the deepest crimes of the Clintons and the DNC. But it’s beginning to look as if it will be business as usual and any justice in America must be of the do-it-yourself variety. I’m afraid we may soon have to take our safeties off and take to the streets.